Manifolds are used to connect two or more cylinders of gas together to increase the supply volume available to provide a continuous flow when one cylinder is not sufficient and a tube trailer or other bulk supply is not practical. Manifolds are also used when a single cylinder of gas is not capable of supplying the required flow rate required by a process. WARNING: Never mix gases on a manifold. Only one type of gas should be connected to a manifold. Manifolds are commonly fabricated in a single row configuration designed for wall mounting with a row of cylinders in line beneath or in front of it. Double row manifolds and other custom configurations are available on request. Station valves are used to isolate individual cylinders on a manifold from service. Station valves are recommended for most laboratory applications as they are a valuable back-up device in the event of a leaking pigtail or a defective check valve. It is most important that station valves used in high purity gas service be of the diaphragm packless type to maintain gas purity. Many commercial manifolds use packed valves that may cause atmospheric impurities to enter the gas stream as contaminants. 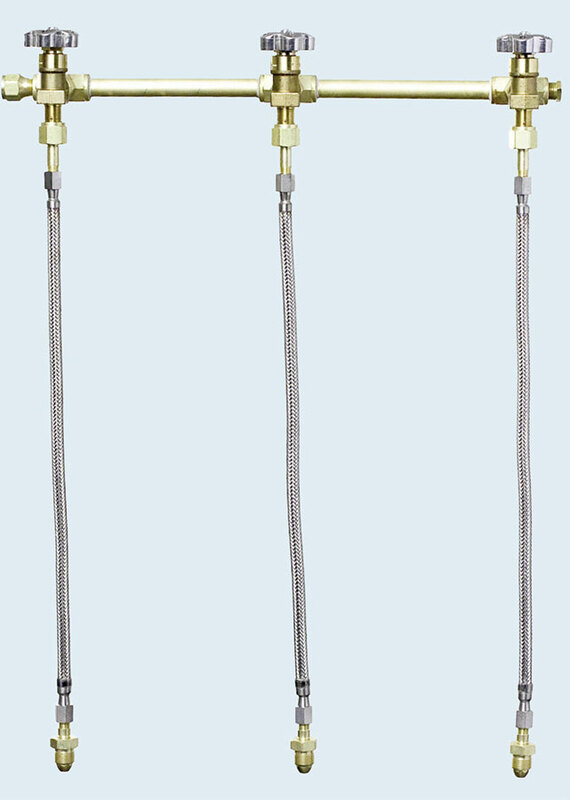 Two types of pigtails are used to connect cylinders to the manifold header; rigid pigtails made of brass or stainless steel tubing, or flexible made of stainless steel braided hose with either Teflon-lining or stainless steel inner core. Teflon-lined pigtails are used for routine applications, while the stainless steel inner core pigtails are used for ultra high purity applications. One special note, either rigid pigtails or stainless steel inner core flexible pigtails are recommended for helium and hydrogen because these gases will diffuse through the wall of a Teflon®-lined pigtail. Check valves on the cylinder end of each pigtail should always be installed on manifolds used for flammable, toxic, or corrosive gases. In some cases purge assemblies are installed to ensure that highly toxic gases are not released to the working environment during cylinder change outs. Many applications require that gas always be supplied to the process and the flow can not be shut down to replace empty cylinders or must feed gas for long periods when the system is unattended, i.e. helium to a gas chromatography laboratory. In these instances a changeover manifold is the solution. Changeover manifold control sections available in this catalog (see pages 38-43, can be used with any of the multiple station manifolds or with a single pigtail on each side.